All transactions are safe and secure with a reliable history in online purchasing behind each of our associates. 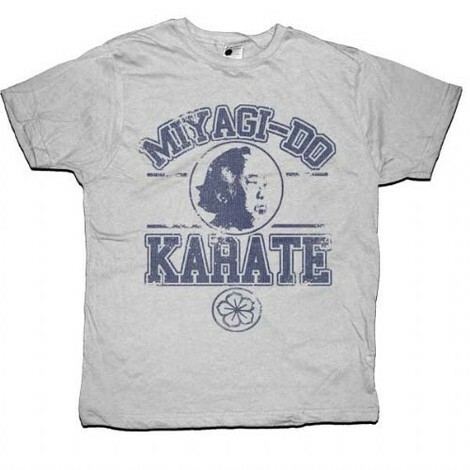 Buy the Miyagi-Do Karate Kid t-shirts to own Karate Kid clothing and merchandise. Daniel LaRusso himself actor Ralph Macchio holds up the Miyagi-Do tee that features a logo for Mr. Miyagi's dojo. Sure, it isn't as big as the Cobra Kai dojo, but we think the instructor is far superior to John Kreese (Martin Kove). Pair it with the Cobra Kai t-shirts that read, 'Bow to Your Sensei!' and represent both the good guys and the bad. Miyagi-Do is a little more friendly and does not have mottos like, 'Fear does not exist in the dojo!' This vintage Karate Kid t-shirt is available in five different sizes. In addition to the Miyagi-Do Karate Kid tees above, browse the Karate Kid Clothing Gallery for more apparel like men's and women's clothes, kids shirts or hoodies.